Web search goliaths Google have delivered a large size nine up the rear end of their fierce rivals Yahoo by being the first to launch a local search service in Britain. Like its popular US counterpart, Google’s local search service will offer maps and driving directions, and is their first such offering in Europe. Now in public beta, the service is offered in partnership with the UK commercial telephone directory company Yell, who provide the business phone numbers and addresses. 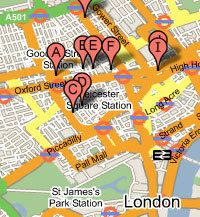 Users can find local services by simply typing in their query into two boxes, labelled, “what” and “where”. 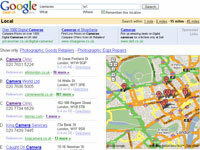 For example, typing in ‘cameras’ and ‘W1’ will produce a list of camera shops in the London W1 area, complete with addresses, phone numbers, a map flagging up the locations and a clickable link for more info. “It’s the first time we’re bringing local search to a country outside North America,” said Kate Burns, ad sales and operations manager for Google in Britain, declining to give details about launches elsewhere in Europe. The cooperation with a telephone directories company is unique to Britain, Burns said. Local search is the big hot potato for Web search providers, who are salivating at the prospect of a nice new advertising niche opening up. Global search advertising revenue is already sending cash tills into overdrive, with US investment bank Piper Jaffray estimating spending to rise to US$7.9 billion (£4.1BN/€6bn) in 2005 from US$5.5 billion (£4.1bn/€4.2bn) in 2004 – with most of the growth coming from international expansion and higher volume. Google has also unveiled its Google SMS (Short Message Service) in the UK. This service enables users to send queries as text messages from a mobile phone and get information local business, driving directions and dictionary definitions. There’s also a facility to compare online product prices with high street ones. Phone users will be charged with normal SMS text tariffs for the service. Next Next post: ITN Launch 3G UK Election Coverage On Vodafone Live!